This is a great design on a gorgeous fabric but I discovered in October than it's easy to get burned out just doing rows of black. So once I finish 12 Days of Christmas this will become my "bath time project" and I will stitch a length or two of black each evening while the Small Boy is in the bath. 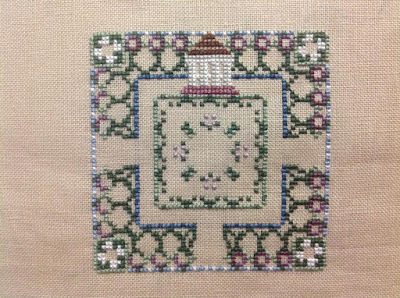 Slow and steady is the name of the game on this next piece; Just Nan's Summer in the Square. I started Spring in the Square on 1st January for the Ten-a-Day challenge and when it became obvious I was going to finish it before the year was over, I started Summer on 1st July. As well as the Ten-a-Day I've also had a Thirty-a-Day which has been the series of Just Nan freebie ornaments. I got a little behind with the fully-finishing so spent Sunday doing Lacy Diamond which was finished in September. A simple padded diamond backed with blue felt, white bead hanger and a white tassel. I'm not working this weekend so hopefully I can get another one fully finished. Pie for this months shows a variety of projects, with Just Nan Memories taking top spot. I spent five days on the Kooler Zodiac because I did Scorpio at the beginning of the month and Sagittarius at the end. Stitch from Stash was a great success, the only thing I spent was £ 8.72 on a magazine subscription which is an allowed purchase anyway. 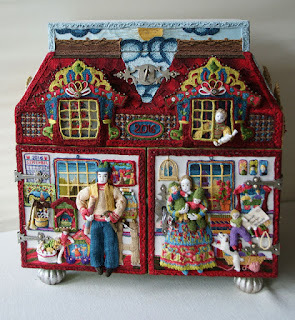 Finally, the Advent Calender Blog Hop starts tomorrow! I will put up the main post in the morning and you can follow the links each day to see what each person has posted. I will be updating the post every day with a new picture. Hope that you enjoy the fun this year. As my finishes are mounting up, I have fewer projects to choose from and worked on the same three as last month plus one more. That extra one was the Witches by Oberlin Samplers and a finish, as shown in my previous post. November - What finishing style have you never tried but would love to do? I have tried quite a few different techniques apart from framing. What do these all have in common? Not a lot of sewing! I like papercraft. One finish I would like to try is a Printer's Tray with various sized apetures and I did see a video of a handmade journal which looked fun. Or maybe Janet Brandt's Once Upon a Time Cabinet? Finally, all the Advent Calendar emails were sent out this morning. If you haven't had yours, please let me know and I'll check the address I sent it too. Not long to go now! You know I detest bagpipes. The place has now become something between a menagerie and a madhouse and a man from the Council has just declared it unfit for human habitation. At least Mummy was spared this last outrage; they took her away this afternoon in an ambulance. Things are not improving between Emily and her "true love". Joan Elliott's Piper has wisely taken the decision to play his pipes on the shores of a loch near a castle rather than a suburban house full of birds and dancing people! I'm actually a good way through the final block as I wanted a headstart so I can finish the beading in December. You've already seen the Christmas block above, so it's time for Hallowe'en. The theme for November is Candy Corns or Food. I am not sure you would want to eat from the menu in this piece! Fillet of snake anyone? This design is called Witches by Oberlin Samplers. The fabric is actually a lime green Murano but it's difficult to photograph, think DMC 3345 for colour. The original design had some random spooky phrases round the edge but as I had already stitched the Hallowe'en Happiness with various spooky phrases I decided to change this to reflect a speech from my favourite Shakespeare play - the Scottish one! I also changed the words to the right which said Ghosts and Goblins to "brew a spell". There were no ghosts or goblins in the design! I added a bat charm to fill the space. I already have a frame, I just need the mount board and it will be done. Rather a good Small Month! Finally, I have all the names for the Advent Calendar Blog Hop and will be sending out dates and instructions on Sunday. Milly left a comment on my TUSAL post saying she would like to join us but left no contact details. If you are reading this, Milly, you are no-reply, have no email in your profile and no blog details either. If you contact me by email before Sunday I can still include you, but I need a blog and an email address to do so. Thank you! I am actually a day late with the TUSAL which almost never happens but I was so ill yesterday! I came down with the bug that has kept the Small Boy off school all week. I spent all of yesterday either asleep or being sick in the bathroom. I managed my 10-a-Day, skipped the 30 as it was beads, put five little stalks into Just Nan's Memories to say I'd worked on it and 2 little stitches on 12 Days of Christmas for the same reason. Fortunately I feel better today, delicate but able to finish two projects! It was really slow going, I have never made so many errors; threading the wrong colour, frogging the satin stitch and even losing the needle at one point. At least I didn't spill the beads! 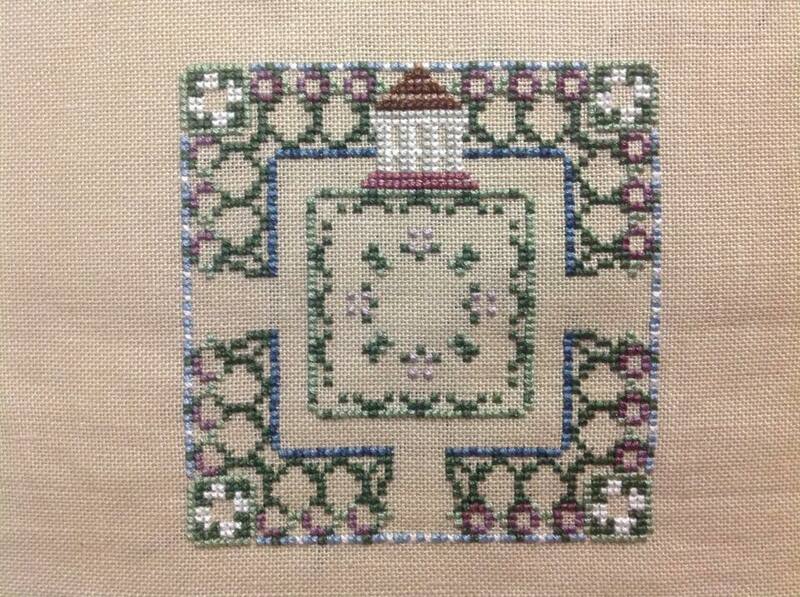 The first completed project was Memories by Just Nan, this was a gift from the lovely Vickie of A Stitcher's Story. I chose a fabric in her favourite colour - Pink, and added one more personal detail, can you spot it? The chart didn't come with the bead pack so I substituted what I already had - 00479, 00553 and 18828. This was a nice quick stitch, only 17 days. I will turn this into an ornie when I have the energy! Short and sweet today, I am in need of a lie-down now. Welcome to the November link-up for Gifted Gorgeousness. The linky will stay open until the end of the month so you have plenty of time to link up and join in. Another great month for Giftedness. As well as stitching on gifted pieces I also gave three away as prizes in the Hallowe'en Trick or Treat Blog Hop. So now I hand over to you. This is where you link up your post for this month. Please use your name or your blog name in the field and NOT the words "November Update" so I can easily see who has linked up this month. And link to the actual post, not just your blog. It is easier if you copy and paste the link, rather than typing freehand. which Christine thought sounded like a Heston Blumenthal soup. They are both used in spells to steal a witch's power. And poison her too! 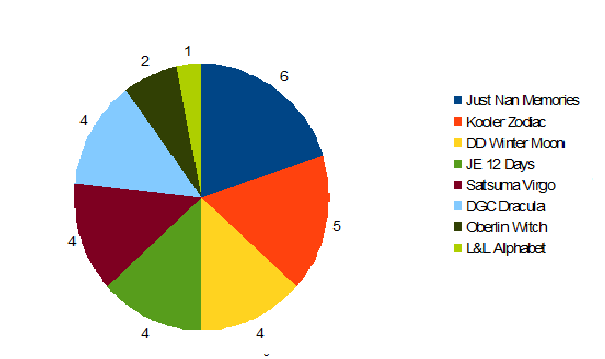 I asked everyone to pick their favourite chart from the three on offer and put all the names on a spreadsheet. If you were a picture poster you got an extra chance in the draw. 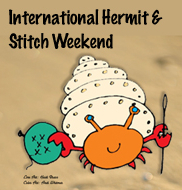 Ariadne said "As Halloween is not celebrated here I haven't got any stitched pieces. I only show some Halloween things (pumpkin, carving tools, a little witch and stickers) to my pupils and we draw a haunted house. 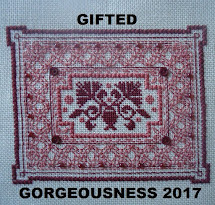 Well who knows till next year I might have my own stitched piece and might take part in the blog hop you will organize next year too!" So I am holding her to that, next October I shall expect to see a start at the very least! A lot of people did not specify a chart so I put all the names back in and drew one more. I already have this person's address so they will get a small surprise some time before Christmas! I don't have addresses for the other three winners, so please email them to me. Since Dark October finished I have returned to my usual rotation, starting with the Zodiac stitching for the SAL. I am so pleased that everyone is enjoying this SAL so far and we've had a couple of people link up too. I was enjoying the Satsuma Street Virgo so much that I decided to do a few more days on her and try complete the top half of the chart. I did better than that, the half way point is the bottom of her left arm so the zigzag coming down and the end of the sheaf is all the second part of the chart. I just love those colours although they are hard to photograph while still getting the fabric to look black. 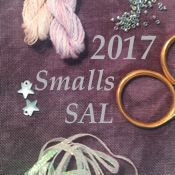 There is a bit more Pearl Kreinik, a crescent moon in Kreinik and then some beads and we will have a finish this month! I am undecided what to stitch after that, it should really be something from my WIPocalypse list or maybe a smaller design to try get another finish? We shall see. Regular followers will know what that door means - it's time to sign up for the Advent Calendar Blog Hop! For this hop, each participant is allocated a day in December to make their post on. They will show something they have stitched on a Christmas theme and answer the topic question I set. I then copy their photo onto my blog post in the style of an Advent Calendar. Finally, I track my comments and I recently received my 15,000th comment from MsOhSewCrafty! No, she didn't make all 15,000, that's the cumulative total from you all. Thank you so much for commenting on each post. I try to reply to all even those tricky no-reply people! I do appreciate that you take the time to visit, read and comment. Thank you.